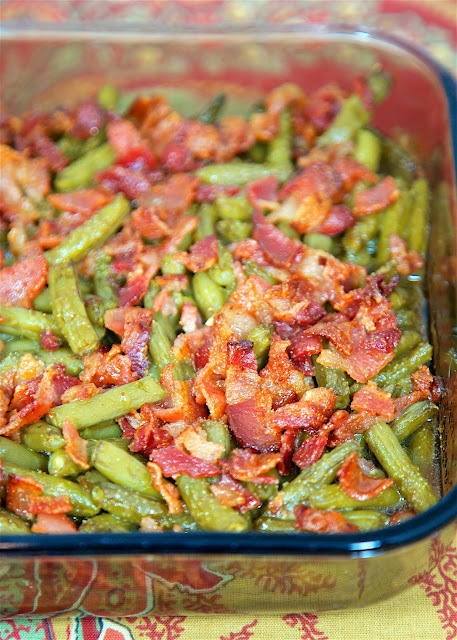 Smothered Green Beans - canned green beans baked in bacon, brown sugar, butter, soy sauce and garlic. This is the most requested green bean recipe in our house.Everybody gets seconds. SO good!! Great for a potluck. Everyone asks for the recipe! Super easy to make. These Smothered Green Beans are ridiculous! OMG! SO good!! 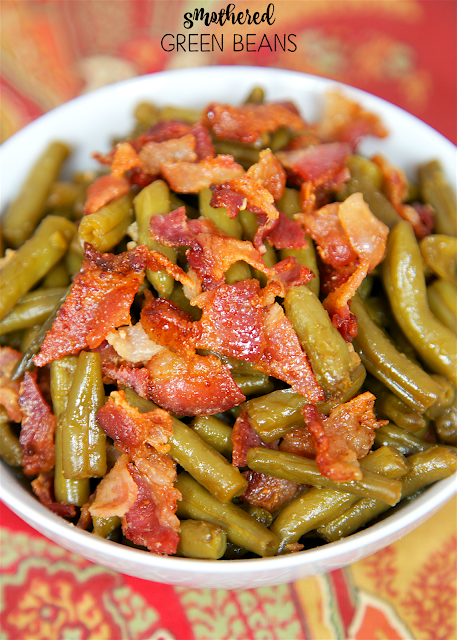 Green beans smothered with bacon, brown sugar, butter, soy sauce and garlic. How could they not be good? The best part is that this casserole only takes a few minutes to put together. You can actually cook the bacon ahead of time and this would be ready in about a minute! Woohoo! This makes a TON! We ate leftovers for several days and they tasted great! This would be the perfect dish for a potluck or dinner party. I promise everyone will go crazy over these Smothered Green Bans! SO easy and SO delicious! Pour drained green beans in an ungreased 9x13-inch pan. In a large skillet, cook bacon until almost done but not too crispy. Remove from skillet, drain on paper towel and chop. 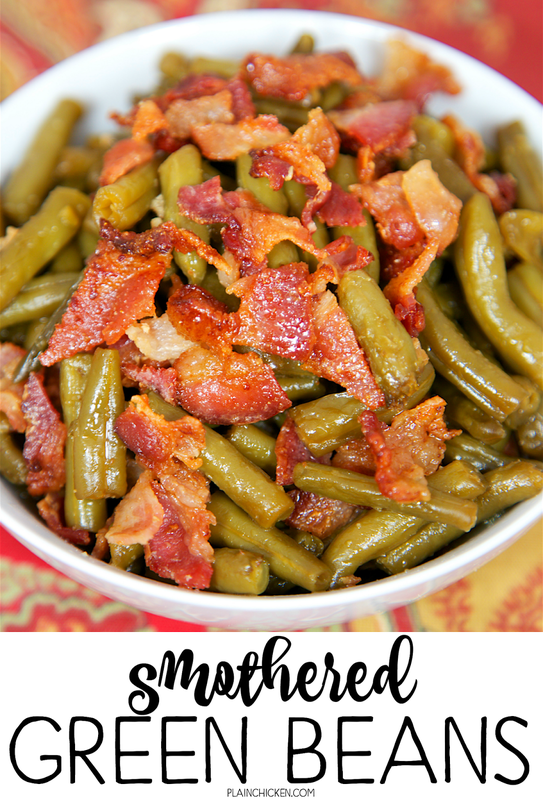 Sprinkle cooked bacon on top of green beans. Cranberries sound good! I will try that next time. We loved this! I can't believe I've never had it before now!!! I haven't tried it with fresh green beans. I'm sure you could, but I don't know the cooking time or quantity. I agree!! Bacon makes veggies SO much better! Enjoy! Similar to my the "Sweet and Sour" green beans my grandparents always used to make. They added a bit of finely chopped onion cooked with the bacon. This recipe was excellent! My daughter loved this! Very similar to my Green Bean Bundles but would be much faster & easier without all of the bundling! Perfect description!! Much easier than bundling. Enjoy!! I will be making this with Splenda brown sugar blend and halving the recipe. Can't wait! I haven't made them in the crockpot, but I think it would work fine. Enjoy! I have made these in the crockpot and used thawed frozen green beans and it came out great and didn't have to have another item in the oven at Thanksgiving. I've made these in the crockpot and they turned out great and I used thawed frozen green beans. I didn't have room in my oven with the turkey in there and then they could be dished right out of crock. @Bustybrown-- how long did you cook them in the crockpot? On low, I presume? @Bustybrown-- love that idea. How long did you cook them in the crockpot & on low, I presume? I actually can't remember but I think it was on low for several hours. I'm going to cook on high today for just around an hour. I also cooked the bacon ahead in the oven so I just broke it up into the crockpot from the frig and I also cut down on the amount of sugar in half from the first time I made it by the recipe. It was way too sweet for our liking. If taking these to a potluck, could I prepare the recipe that morning, then bake them later? If not, what you recommend for reheating the dish as a whole later? If making these for a potluck, could I prepare the recipe in the morning, then bake it later? If not, what would you recommend for reheating the entire dish later? I think it would be fine to assemble the casserole ahead of time and bake it when you are ready. That should be fine. Enjoy! Would you happen to know the measurements for a family of 3? Would it work to usethe Hormel Real Bacon in the bag?? Yes - that would work fine. Enjoy! Do you add the bacon grease in as well or just the bacon? Do you use the bacon grease as well or just the drained bacon? I just use the bacon. I don't put the grease in the casserole. Enjoy! 350 degrees that is a hot oven. The recipe means 350°F. 350°C IS very hot! Just want to confirm - Is 5 cans of green beans a typo? Wouldn't think all of this would fit in a 9x13. Also, if you cook this in a crockpot, what do you put it on (mins for high or low)? Thank you! 5 can of green beans - no typo. I've never made this in the slow cooker. I wouldn't think it would take long to cook in one. Let me know if you try it! Just want to confirm that 5 cans of green beans isn't a typo - ? - didn't think all of that would fit in a 9x13 ... Also, if cooked in a crockpot what temp and how long would it cook? Thank you! Do you drain the green beans first? I bake them uncovered- Enjoy! Two questions. Does it matter if it's salted or unsalted butter? Can I halve/half this recipe? Thank you! I always use unsalted butter. You can definitely half the recipe. Enjoy! If I half the recipe does it still cook for 40 mins in a 350 degree oven? yes I made these last night...Yummy! If I don't like soy sauce do you think I could just use chicken broth? Hi Stephanie! I just made these for Christmas dinner for the entire family and it was a HUGE hit! This will definitely be a new addition for holiday family dinners. I will have to double next time since it was gone. I made mine in the crock pot and would do it again. Thank you again for sharing this amazing recipe! Does the sauce thicken when you make them in the crockpot? How long did you cook them and on low, I presume? The above recipe indicates it serves 10 so cut it in half for 5 and have some left over. I included this recipe in my weekly cooking session. I used 3 cans of green beans but the full amount for the sauce and added some onions with the bacon. Oh my word! I'm not going to have any problem making sure none of this goes to waste! Can't wait for Monday's lunch!! Do you bake covered or uncovered??? Low sodium soy sauce for health reasons, or because it would be too salty with regular ? You can use regular. I just usually have low-sodium on hand, so that is what I used. I also get tons of comments about sodium content of recipes, so I look to reduce it where I can. Is the brown sugar packed or unpacked? Also, how will it affect cooking time of I swap canned grean beans for fresh? Made the Smothered Green beans this evening for my Bunco group and it was awesome. Several ladies asked for the recipe. I will be making this again. I followed the recipe except I did not have low sodium soy sauce so I just used regular soy sauce. So good! These were a hit at an office get-together. Several people asked for the recipe and already requested it for next year's event! Easy and delicious! YAY! SO glad everyone enjoyed the green beans!! I made these recently and they were a huge HIT! Thanks for the recipe. War Eagle!! My cousin made this and brought it to a party and I loved them.. making them this weekend.. Thanks!! Can these be made without soy sauce? you would probably need to add another liquid to replace it. I've never made this without the soy sauce. Can this be made without soy sauce? Can you prep this the night before and cook it in the morning? I have made these for many different gatherings and always a huge hit! Thank you! I'm so glad I keep the ingredients for this stocked up. I was just notified that due to an oversight there will be no vegetable at Christmas dinner. 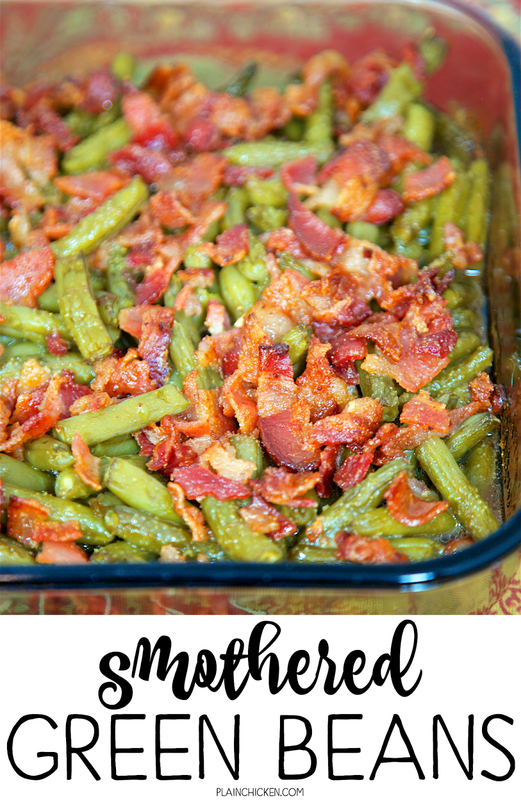 Smothered green beans to the rescue! I'm planning on making this for a cookout/birthday party and apparently there will be 25-30 people attending. How can I make this for that many?? Please help asap! Can this be frozen and reheated later? OMHG! So very good! I added this to my Thanks Giving Menu on Thanks Giving Day 11/22/2018 and it was a Super HIT!!!!! My family lost their minds! I used frozen green beans thawed in the fridge, he loves the firmness of the green beans then added diced onions and fresh sliced mushrooms letting it cook a little longer, 10 minutes or so...Thank you so much for sharing this delightful dish!!!!! Sounds delicious!! So glad it was a holiday meal success!! Made these for Thanksgiving. Oh my yum!!!! Thank you for sharing. I will take this over green bean casserole any day!! Made this for Thanksgiving family dinner. It was a huge hit! Took home an empty casserole dish. Was also asked to bring it to Christmas dinner.WINNER! Can you use the french style green beans instead of the regular green beans in this? My brother made this for Thanksgiving and everyone loved them so I am going to give it a try. How much do you suggest for 35-45 people? How long to cook all in the oven? This is my new favorite green bean dish!! Made it the first time for Thanksgiving and every one raved over it. Making it today for a group of friends!! Stephanie, you should try them with worcestershire sauce instead of soy! I make my green bean bundles this way! Heavenly! War Eagle!